Heading to the airport with loose change in your pockets? You may not mean to, but there’s a good chance you’re leaving cash tips for the Transportation Security Administration at the airport. During FY 2014, passengers left behind $674,841.06 in coins and currency in the bowls and bins at airport security checkpoints. During 2013 travelers left $638,142.64. That was almost $107,000 more than passengers left behind in fiscal year 2012 and more than $150,000 than what was left behind in 2011. According to federal law, TSA gets to keep it and spend it on anything it decides helps provide civil aviation security. If you’re not interested in donating to the TSA coffers you can make sure to put all your loose change in your purse or carry-on before getting to the checkpoint. Or consider donating to good causes at airports in Denver, Phoenix and Columbus, Ohio, where there are pre-security collection boxes by the checkpoints where you can donate spare change to local non-profits. Denver International Airport started the trend in early 2013 with change collection containers placed before several checkpoints and in two years has collected over $170,000 in spare change to support homeless programs in Denver through Denver’s Road Home. Last spring, Fifth Third Bank set up three “Empty Pockets, Full Plates” collection stations near checkpoint entrances at Ohio’s Port Columbus International Airport and in the first six months raised about $1,000 to support the Mid-Ohio Foodbank. Just before all those Super Bowl fans came to town, Phoenix Sky Harbor International Airport kicked off its spare change collection program with boxes set up in front of several security checkpoints. During February, 2015 $1,113.09 was collected to help fund USO operations at the PHX airport. And in Sweden, travelers with spare change can donate to the Swedish Red Cross by playing video games at the airport. Custom-made consoles recently installed at Stockholm Arlanda Airport and Göteborg Landvetter Airport offer travelers the opportunity to pay the classic arcade games Ms. Pac-Man, Space Invaders and Galaga in exchange for coins in any currency. Denver International Airport has collection stations to gather spare change to help local homeless people. 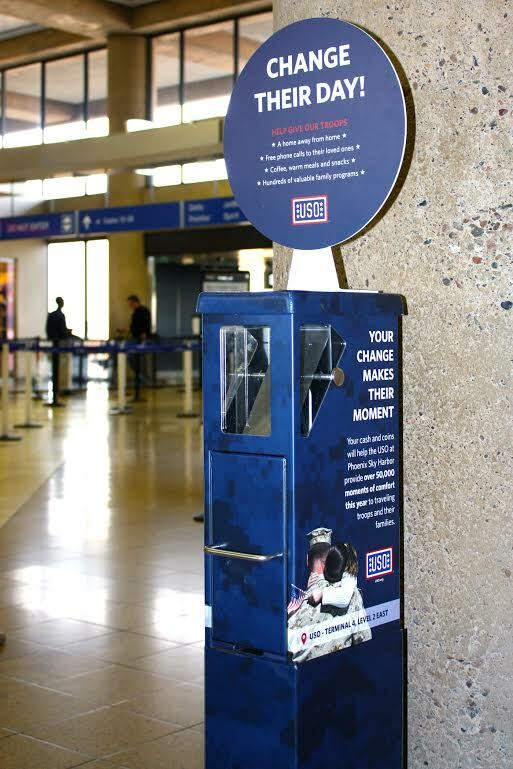 Now, Phoenix Sky Harbor International Airport has set up change receptacles in front of the security checkpoints in the terminals to collect money to provide support for traveling military service members helped by USO Arizona. According to PHX officials, every year about 23,000 troops and their families visit the pre-security USO in Phoenix Sky Harbor’s Terminal 4, which offers a quiet place for members of the military and their families to go before their flights as well as a café, children’s play area, computer kiosks, a movie room, and gaming area. On Monday, Nov 10 – just in time for Veteran’s Day – John Wayne Orange County Airport (JWA) celebrates the opening of a new USO Center. Located in the Airport’s Terminal B, next to the baggage claim area on the Arrivals Level, the center will be staffed by volunteers and offer a canteen, movies, travel assistance and Wi-Fi. It will be open on a complimentary basis to active and reserve members and their dependents as well as military retirees on a space available basis. 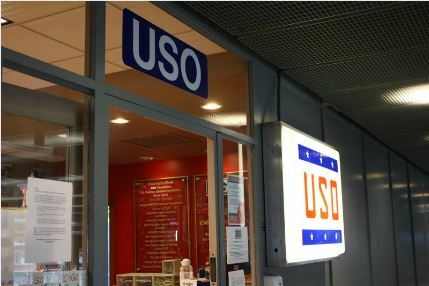 The USO Center at John Wayne Airport will be operated by Bob Hope USO, which also operates the USO centers at LAX, Ontario International Airport and Palm Springs International Airport. A listing of other airport (and other) USO Centers can be found here. On November 7, Dallas/Fort Worth International Airport dedicated two new displays at the Founders Plaza airport observation area to honor the hundreds of local corporate, business and community organizations and the thousands of volunteers who took part in the “Welcome Home A Hero” program that greeted incoming troops at DFW from 2004 through 2012. The new exhibits include a commemorative center detailing the accomplishments of the volunteer greeter program, expanded information about DFW Airport, and an fountain recreating the Airport’s “shower of affection” water cannon salutes over incoming aircraft.